The one ounce Maple Leaf series of silver bullion coins produced by the Royal Canadian Mint (RCM) stand out against proof coins on the bullion market. Featuring the highest purity silver, a brilliant design, cutting-edge manufacturing procedures and privy mark authenticity assurance, it is the only silver bullion series in the world that combines quality refining, aesthetic value and investment security with 99.99% purity. Why buy 1 oz Silver Maple Leaf coins? For over 25 years, the immensely popular and commercially successful silver Maple Leaf series has been the proud flagship of the RCM. This uniquely pure silver bullion coin bears strong trademarks of printing superiority and an exclusive design that rivals the best quality bullion products from the world's leading mints. Investors can be rest assured they are buying outstanding coins at great prices. In addition to the unique purity levels, the silver Maple Leaf has a most recognizable and attractive design, which makes it one of the most tradable coins on the international market, as well as a bullion coin that is also highly sought after by collectors. The 1oz. silver Maple Leaf presents a brilliant option to set off a silver bullion coin collection and at the same time makes a precious addition to your investment portfolio. The 1 troy ounce silver Maple Leaf has a diameter of 38mm, and is 3.15mm thick. The reverse side depictsa single intricately etched maple leaf in occasionally varied motifs. 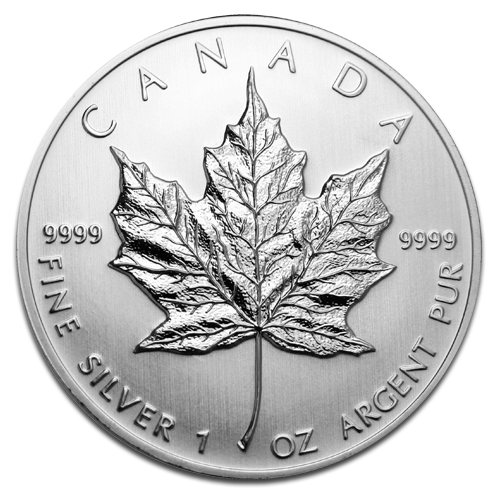 The one universal element in all silver maple leaf coins is the word CANADA, the displayed .9999 purity and the phrase "Fine Silver 1 oz. Argent Pur" along the bottom curve.The obverse side features a head profile of Queen Elizabeth II, in three different versions; young head, old head, and even older head. The name of Canada's Constitutional monarch, the five Canadian dollars face value and the year of issue are engraved on the obverse side. First issued in1988, the one ounce silver Maple Leaf was a great breakthrough for the reputable Royal Canadian Mint (RCM), due to its composition of 99.99% fine silver, paired with the RCM's globally famous manufacturing expertise. The coin's production was a challenge the RCM achieved successfully and subsequently set a new benchmark for highest purity silver coins available on the market today. The silver Maple Leaf adopted the Walter Ott design launched on the gold series and is the most recognized symbol of the largest country in North America. Some annual variations carried a small privy mark on the lower half of the coin, or featured colour enhancement with a different design from the regular one, or holographic enhancements.A number of the privy marked Maple Leafs were available only in Europe, released by coininvest.com. These were the 2009 London's Tower Bridge, the 2009 Brandenburg Gate, and the 2012 Leaning Tower of Pisa. The RCMuses the latest technologies, meticulous quality control and advanced safety measures to print the silver Maple Leaf. The coin's solemnly controlled high-tech printing, together with its widely publicized design and precise specifications make fraud virtually impossible. Even without a privy mark, experienced dealers can recognize an original silver Maple Leaf when they see it. As leading distributors of silver bullion, CoinInvest offer highly competitive rates on 1oz. $5CAD Maple Leaf coins, but with limited resources available we strongly suggest you order at the earliest convenience to avoid disappointment. The coins typically come in tubes of 25 pieces, but single coins can be purchased. There is no restriction to the number of Silver Maples you can order, in fact as the quantity increases, the premium per individual coin will decrease. As a leading dealer in silver bullion products, CoinInvest buy and sell Silver Maple Leafs at extremely competitive rates. To purchase your silver Canadian Maple Leaf coins, simply sign into your CoinInvest account and add the items to your basket by clicking on the orange strip in the volume pricing section. If we have the coin in stock, we will process your order at the earliest convenience, but you should allow at least 10 working days for delivery, as some bank transfers do not reach us for up to 7 days depending on your bank and country of residence. If you have any silver Maple Leaf coins for sale, don't hesitate to contact us; a member of our staff will be happy to discuss a price with you and prepare a fixed fee offer for a limited time only. We will send you confirmation of the offer by email.